2-in-1 hot and cold compression treatment for pain and swelling. Cylindrically shaped to target entire joint area when treating swelling, bruising, injuries, strains and sprains. 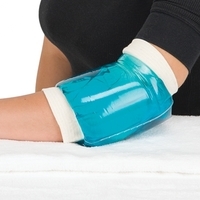 Reusable compress that is easy to apply to the treatment area allows hands free therapy. Sleeves include a re-sealable bag for product storage in refrigerator or freezer, a size appropriate cotton/elastic sleeve to wear under the cold pack, and detailed use and storage instructions. For heat therapy, sleeves can be heated in hot water or microwave oven.